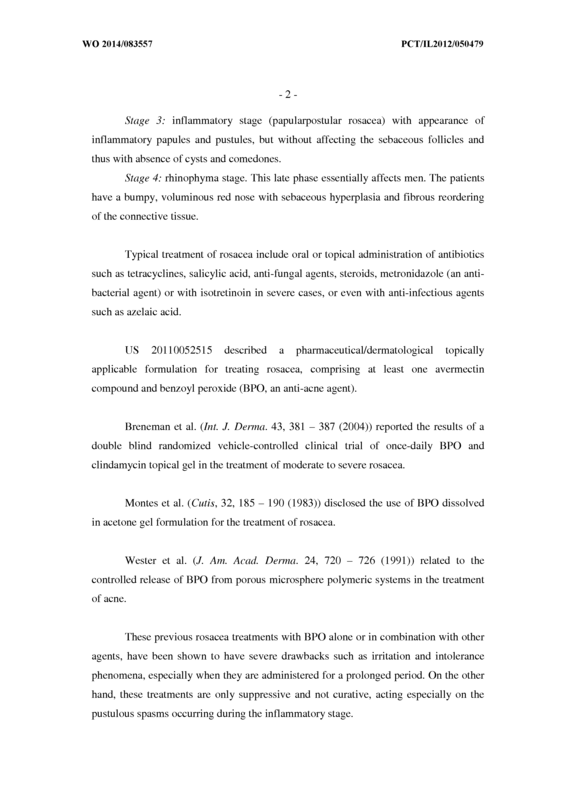 A composition comprising benzoyl peroxide for topical use in the treatment of rosacea of a subject in need thereof, wherein said benzoyl peroxide is in a solid form. 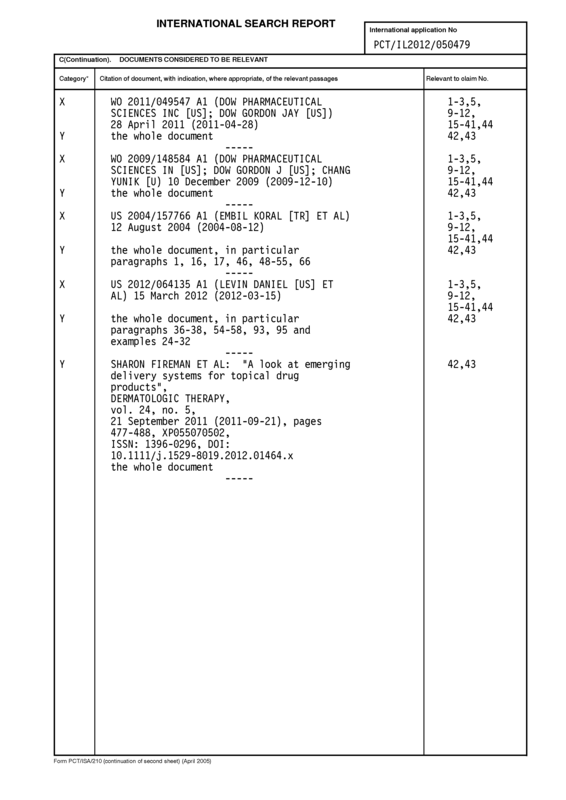 A composition according to claim 1, wherein said benzoyl peroxide is a single pharmaceutical agent. 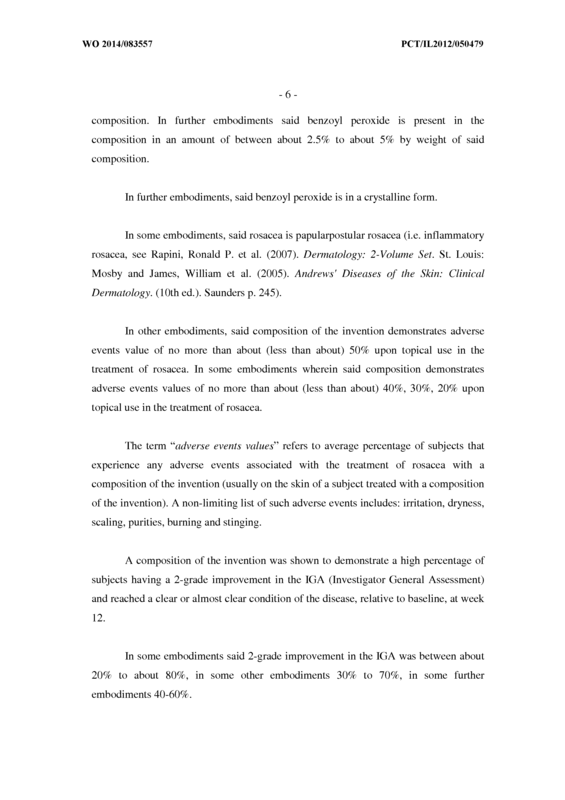 A composition according to claim 1, wherein said composition demonstrates adverse events values of no more than 50% upon topical use in the treatment of rosacea. 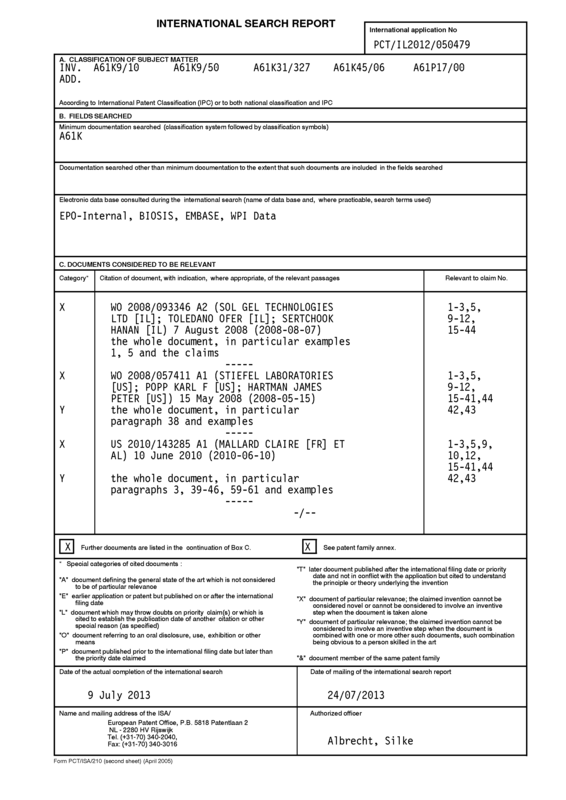 A composition according to claim 1 , wherein said benzoyl peroxide is present in the composition in an amount of about 2.5% to about 10% by weight of said composition. 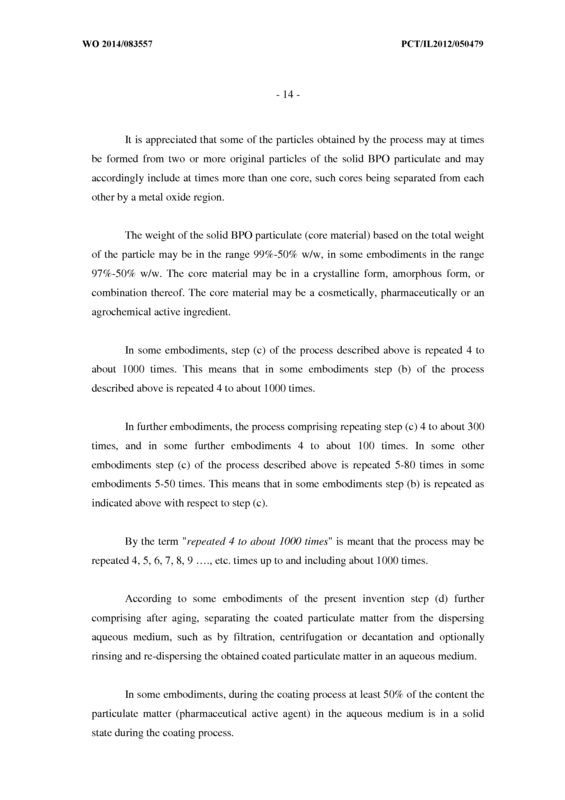 A composition according to claim 5, wherein said dissolution rate is less than about 80% weight/h. 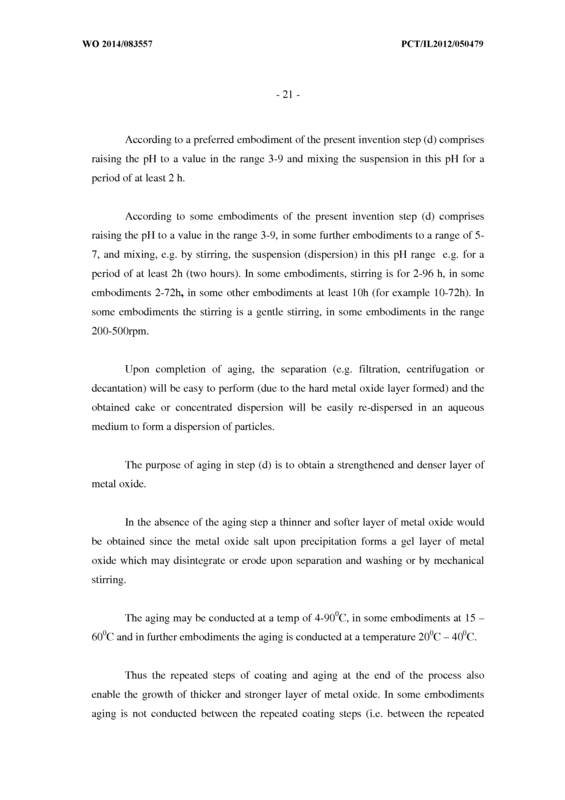 A composition according to claim 5, wherein said dissolution rate is between about 40 to 60% weight/h. 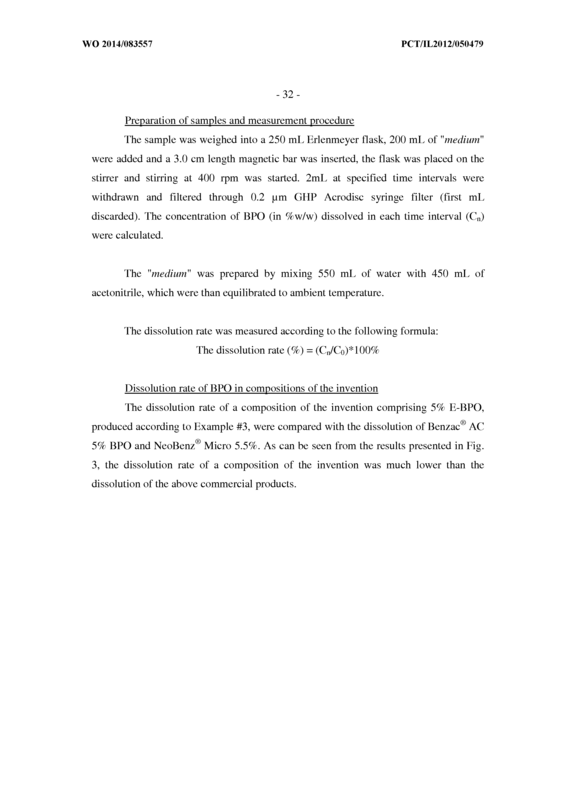 A composition according to claim 5, wherein said dissolution rate is less than about 40% weight/h. 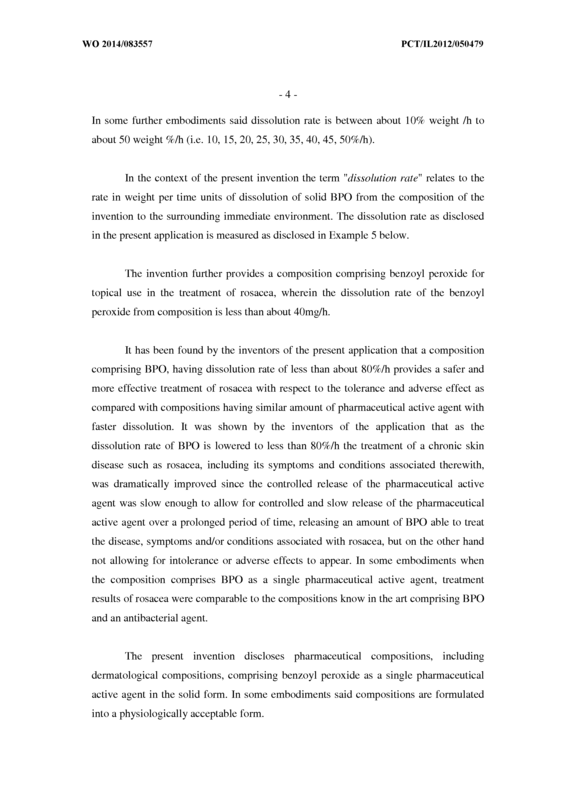 A composition according to claim 5, wherein said benzoyl peroxide is the single pharmaceutical active agent in said composition. 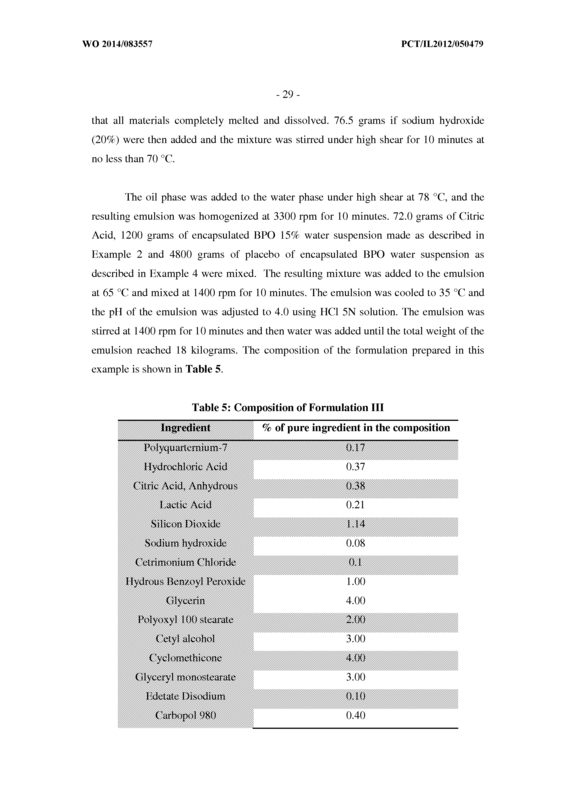 A composition according to any one of the preceding claims, wherein said bezoyl peroxide is in a crystalline form. 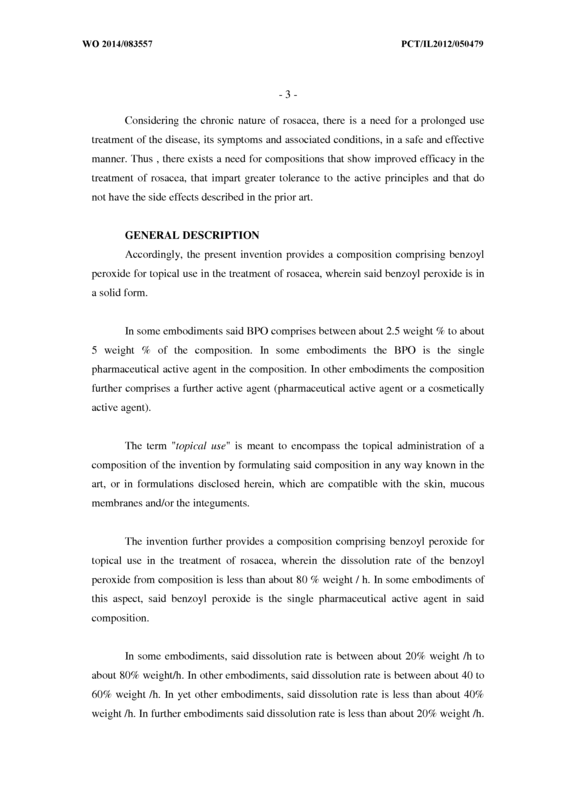 A composition according to any one of the preceding claims, wherein said rosacea is papularpostular rosacea. 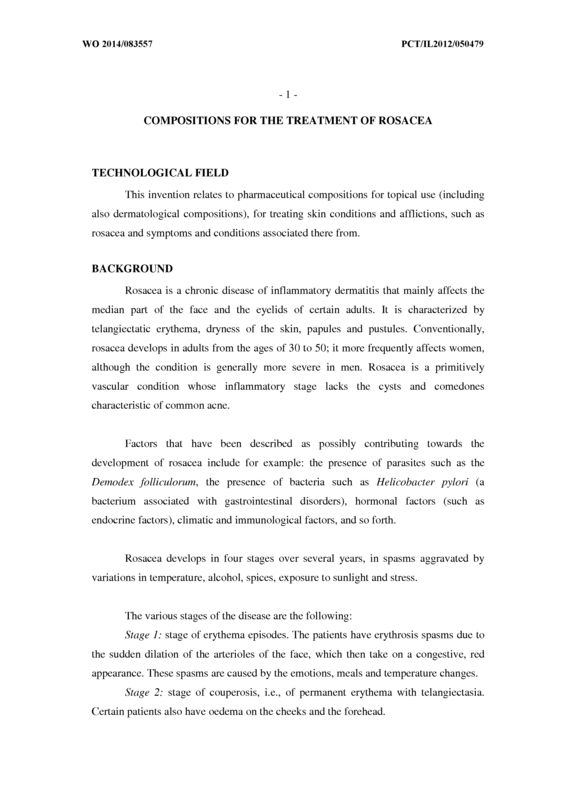 A composition according to any one of the preceding claims, wherein said rosacea is an acne-rosacea type of rosacea. 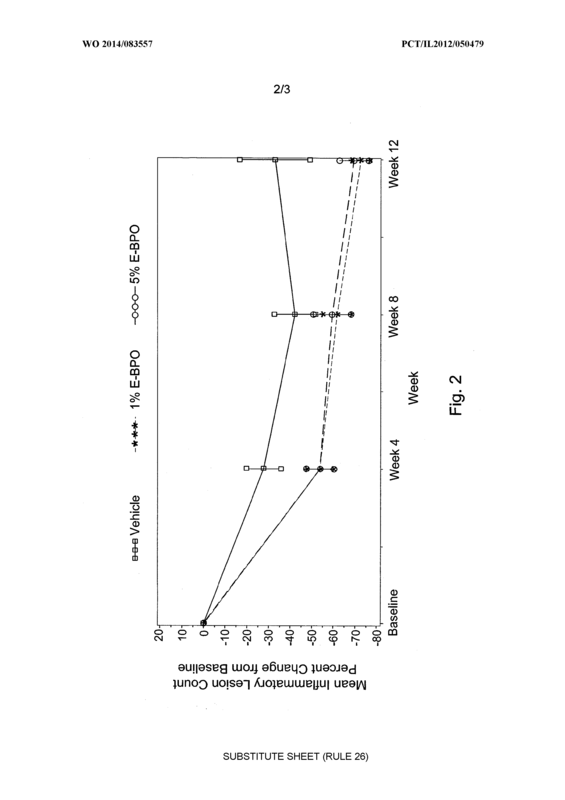 A composition according to any one of the preceding claims wherein the reduction of lesions count relative to baseline at is between at least 30%. 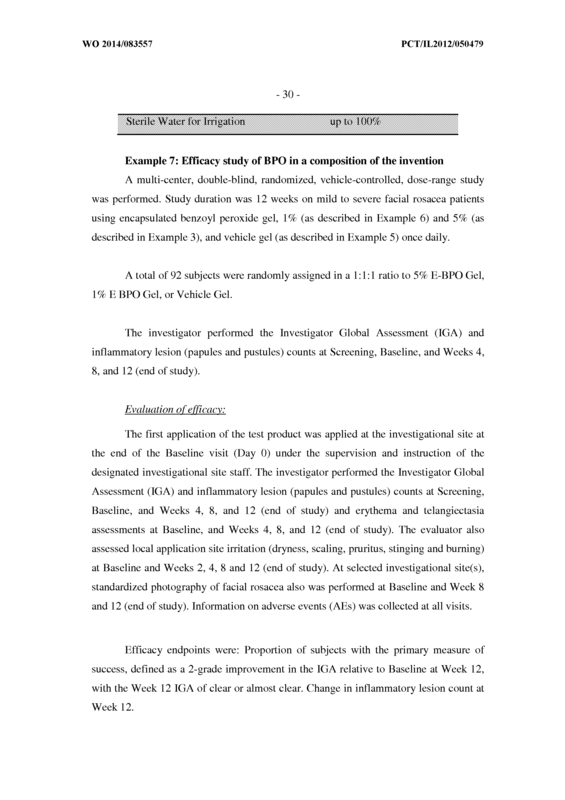 A composition according to any one of the preceding claims wherein the percentage of subjects having a 2-grade improvement in the IGA relative to baseline at is at least 20%. 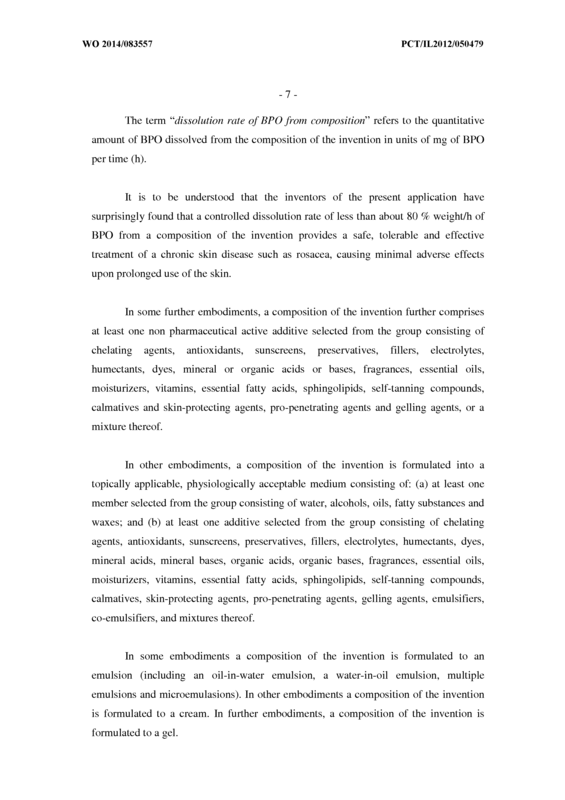 A composition according to any one of the preceding claims, further comprising at least one non pharmaceutical active additive selected from the group consisting of chelating agents, antioxidants, sunscreens, preservatives, fillers, electrolytes, humectants, dyes, mineral or organic acids or bases, fragrances, essential oils, moisturizers, vitamins, essential fatty acids, sphingolipids, self-tanning compounds, calmatives and skin-protecting agents, pro-penetrating agents and gelling agents, or a mixture thereof. 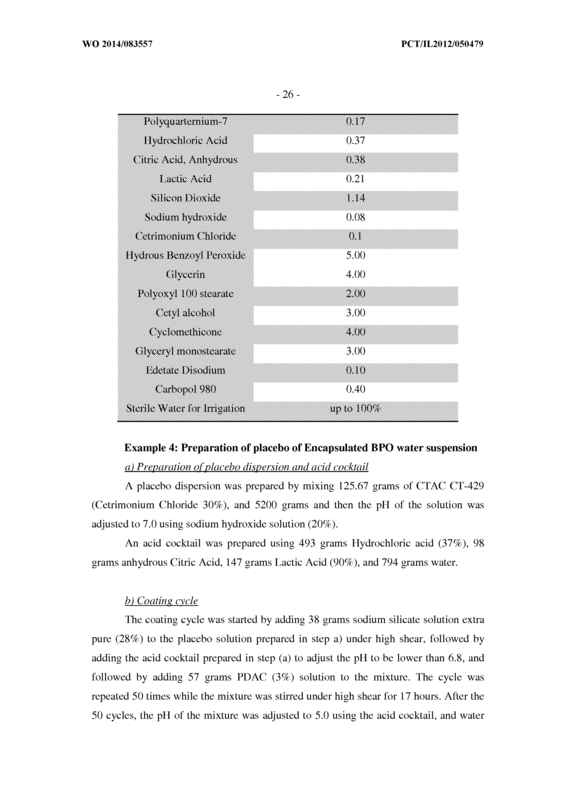 A composition according to any one of the preceding claims, formulated into a topically applicable, physiologically acceptable medium consisting of: (a) at least one member selected from the group consisting of water, alcohols, oils, fatty substances and waxes; and (b) at least one additive selected from the group consisting of chelating agents, antioxidants, sunscreens, preservatives, fillers, electrolytes, humectants, dyes, mineral acids, mineral bases, organic acids, organic bases, fragrances, essential oils, moisturizers, vitamins, essential fatty acids, sphingolipids, self-tanning compounds, calmatives, skin-protecting agents, pro-penetrating agents, gelling agents, emulsifiers, co-emulsifiers, and mixtures thereof. 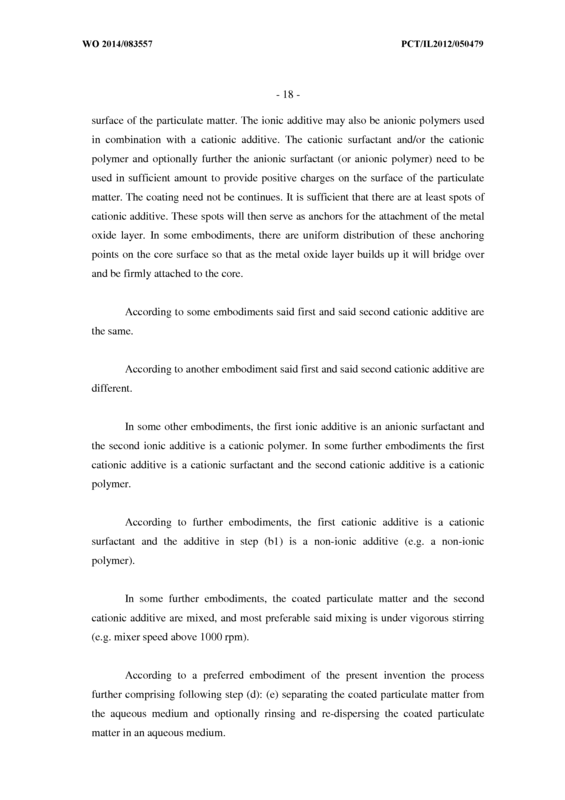 A composition according to any one of the preceding claims, formulated as an emulsion. 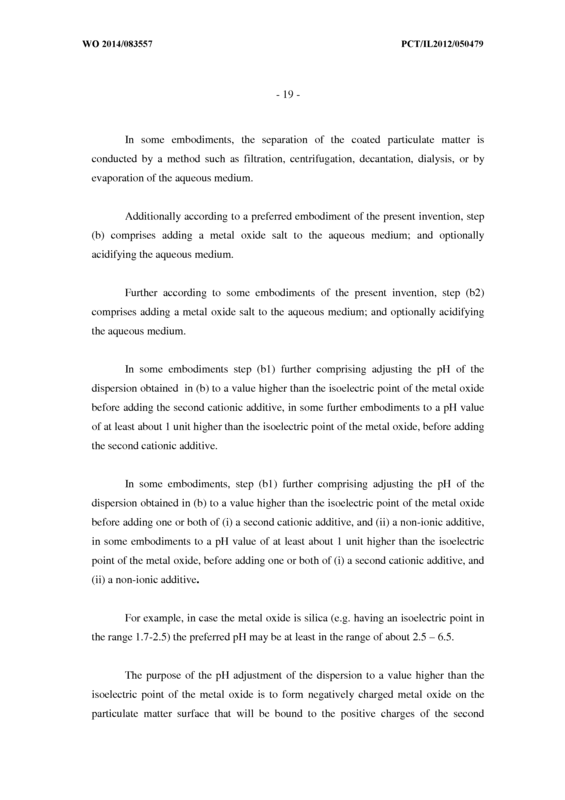 A composition according to any one of the preceding claims, formulated as a cream. 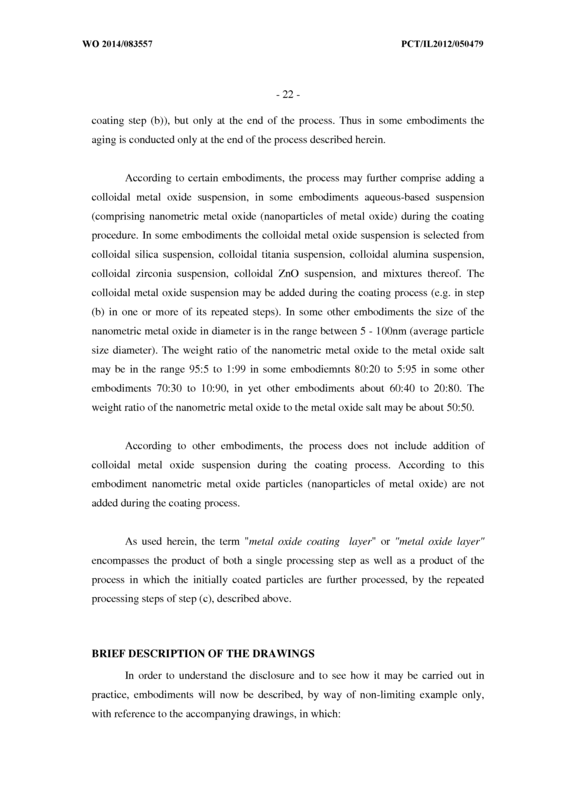 A composition according to any one of the preceding claims, formulated as a gel. 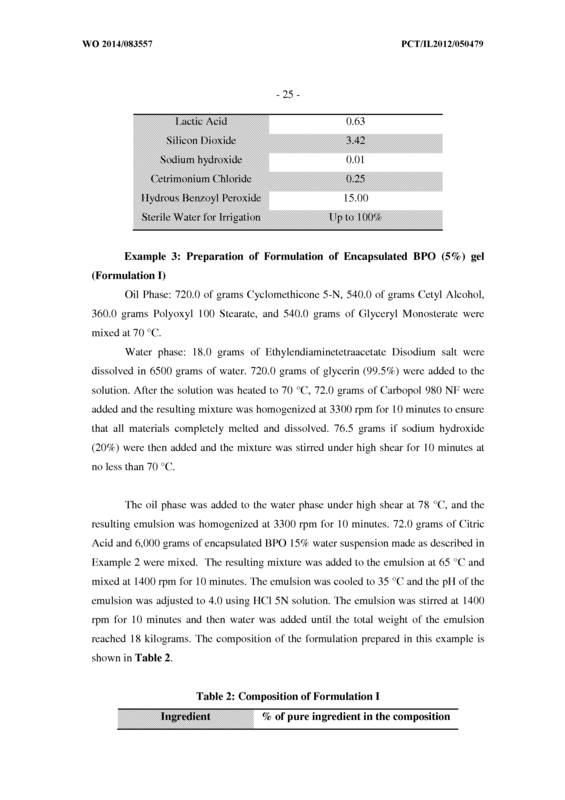 A composition according to any one of the preceding claims, wherein said composition is an oil in water emulsion comprising a polyoxylstearate and a glycerylstearate wherein the ratio of said polyoxylstearate to said glycerylstearate is in the range of 0.1 : 10 to 10:0. 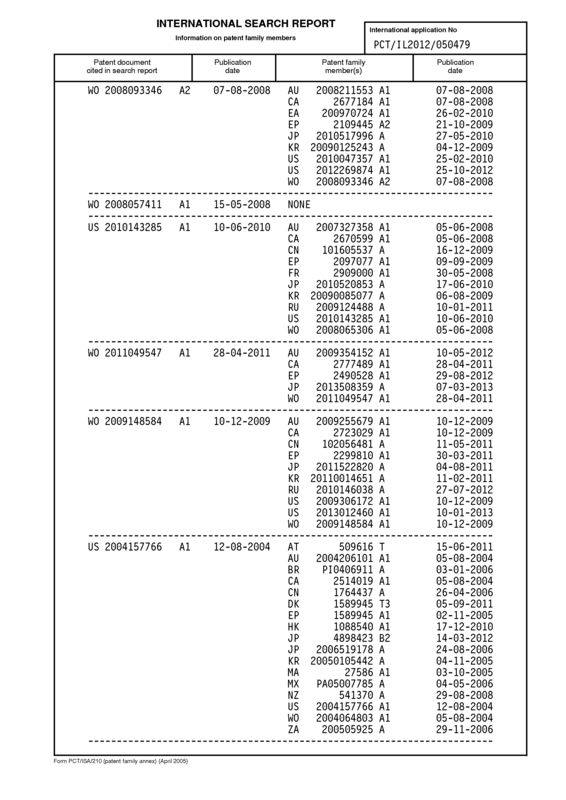 The composition of claim 20, wherein said polyoxylstearate is selected from the group consisting of Polyoxyl-8 stearate, Polyoxyl-20 stearate, Polyoxyl-40 stearate, and Polyoxyl-100 stearate. 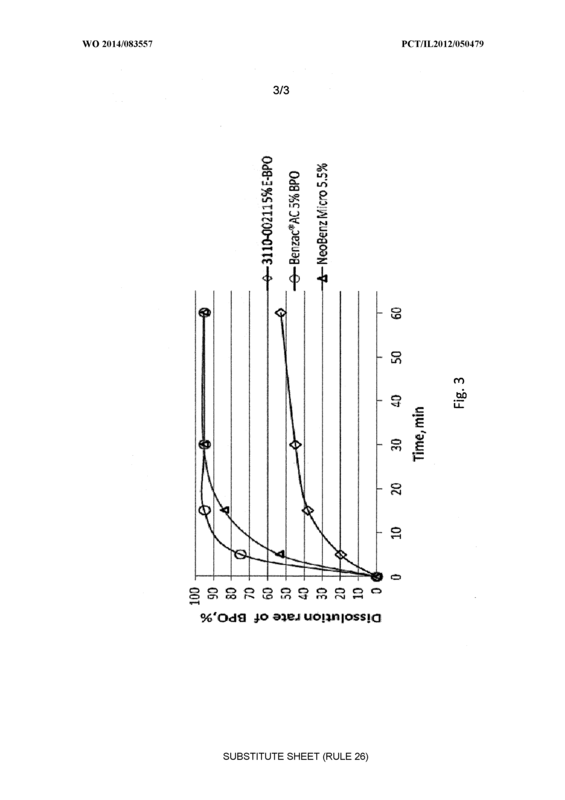 The composition of claim 20, wherein said glycerylstearate is selected from the group consisting of glyceryl mono-stearate, glyceryl di-stearate and mixtures thereof. 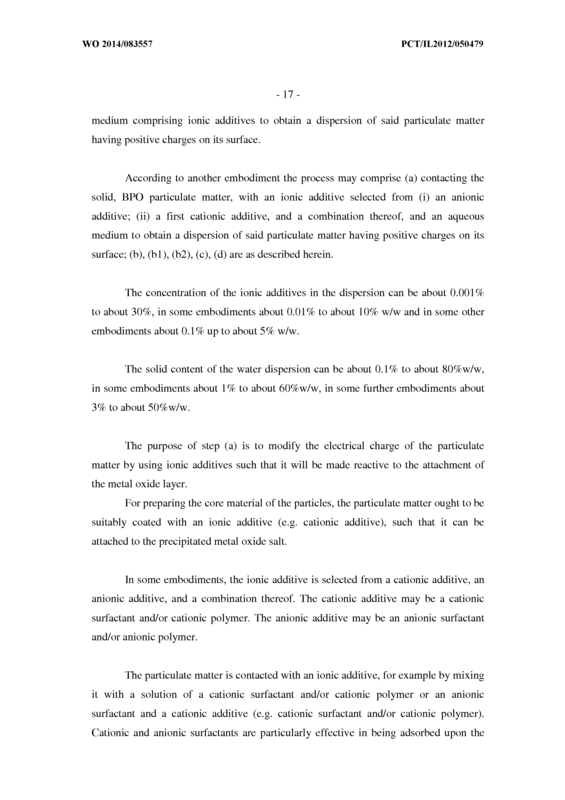 The composition of claim 20, wherein the amount of said polyoxylstearate in said composition is in the range of about 0.1% w/w to about 30% w/w. 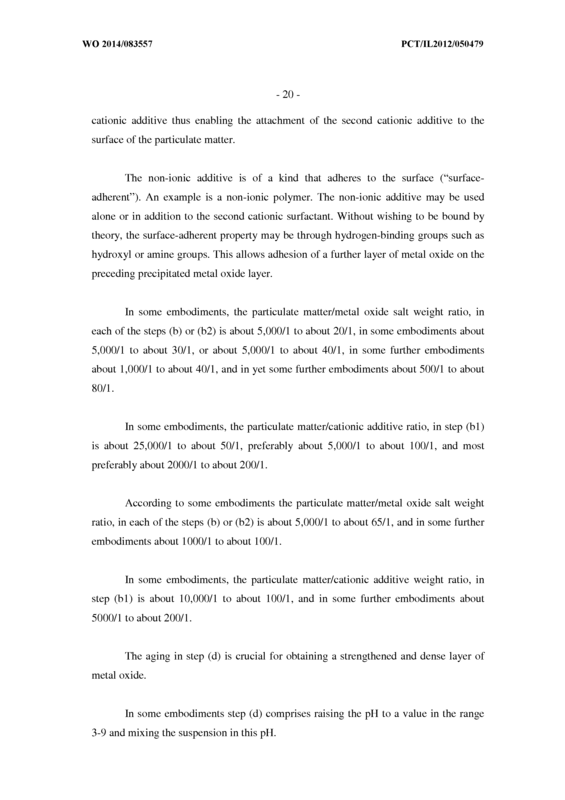 The composition of claim 20, wherein the amount of said glycerylstearate in said composition is in the range of about 0.1% w/w to about 30% w/w. 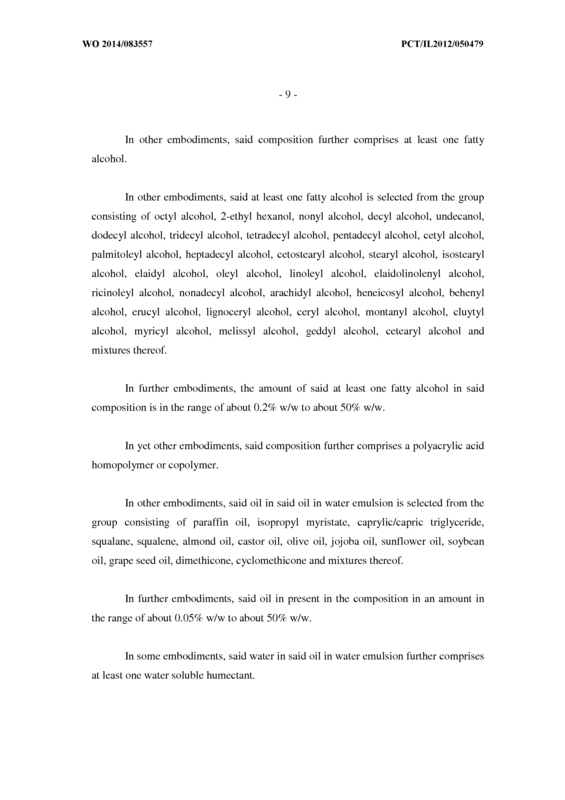 The composition of claim 20, wherein said composition further comprises at least one fatty alcohol. 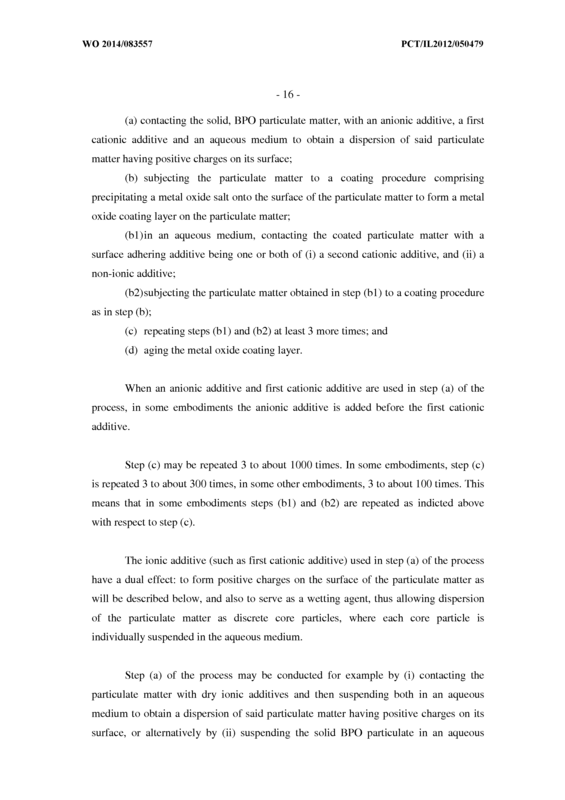 The composition of claim 25, wherein said at least one fatty alcohol is selected from the group consisting of octyl alcohol, 2-ethyl hexanol, nonyl alcohol, decyl alcohol, undecanol, dodecyl alcohol, tridecyl alcohol, tetradecyl alcohol, pentadecyl alcohol, cetyl alcohol, palmitoleyl alcohol, heptadecyl alcohol, cetostearyl alcohol, stearyl alcohol, isostearyl alcohol, elaidyl alcohol, oleyl alcohol, linoleyl alcohol, elaidolinolenyl alcohol, ricinoleyl alcohol, nonadecyl alcohol, arachidyl alcohol, heneicosyl alcohol, behenyl alcohol, erucyl alcohol, lignoceryl alcohol, ceryl alcohol, montanyl alcohol, cluytyl alcohol, myricyl alcohol, melissyl alcohol, geddyl alcohol, cetearyl alcohol and mixtures thereof. 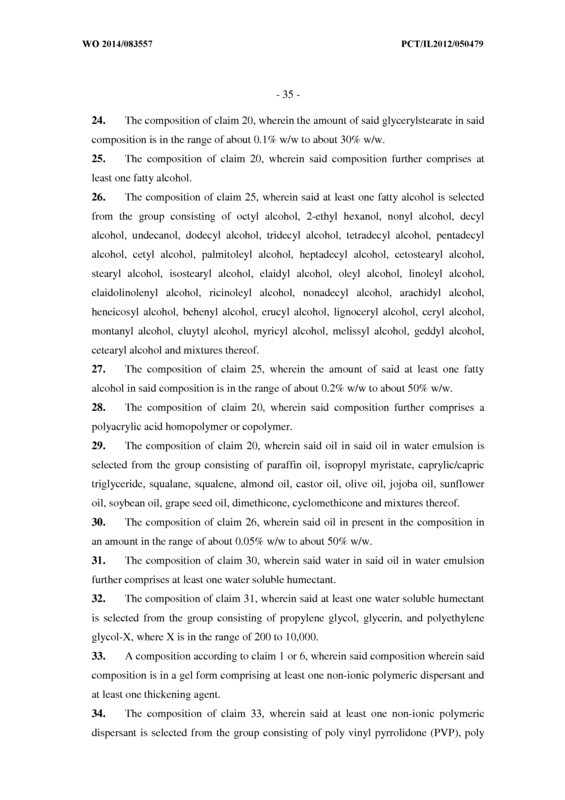 The composition of claim 25, wherein the amount of said at least one fatty alcohol in said composition is in the range of about 0.2% w/w to about 50% w/w. 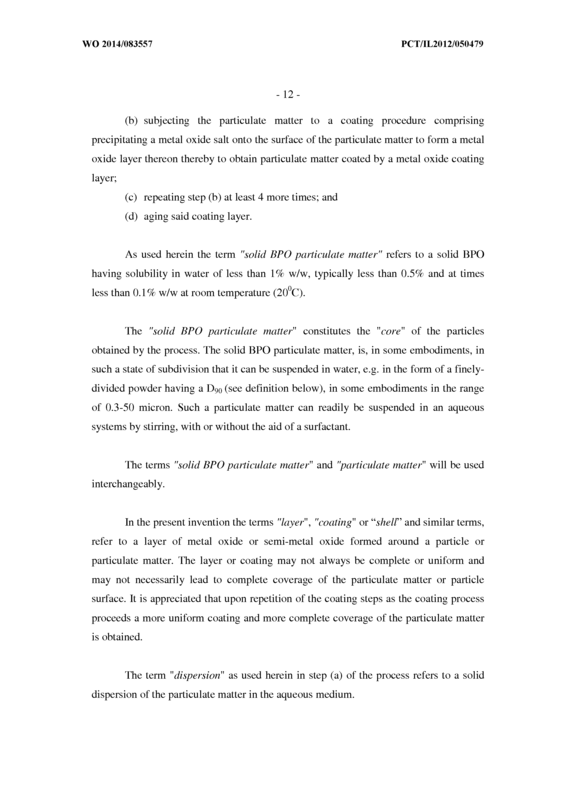 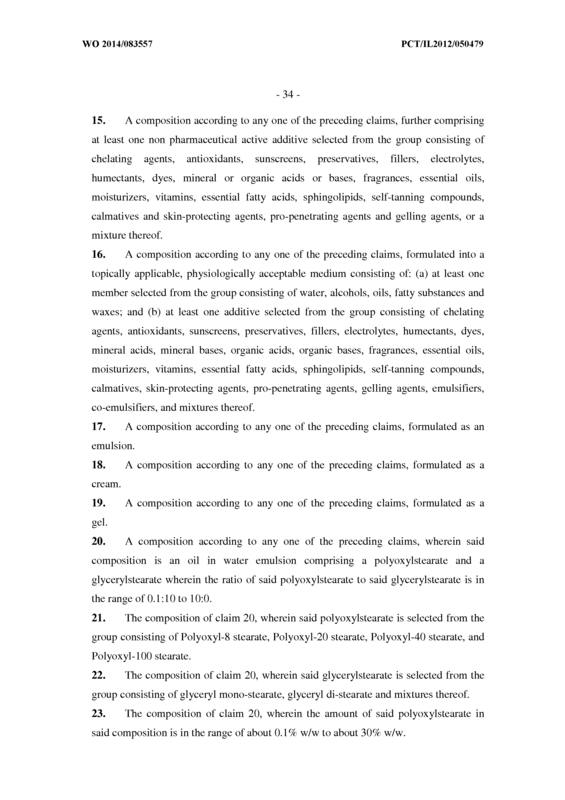 The composition of claim 20, wherein said composition further comprises a polyacrylic acid homopolymer or copolymer. 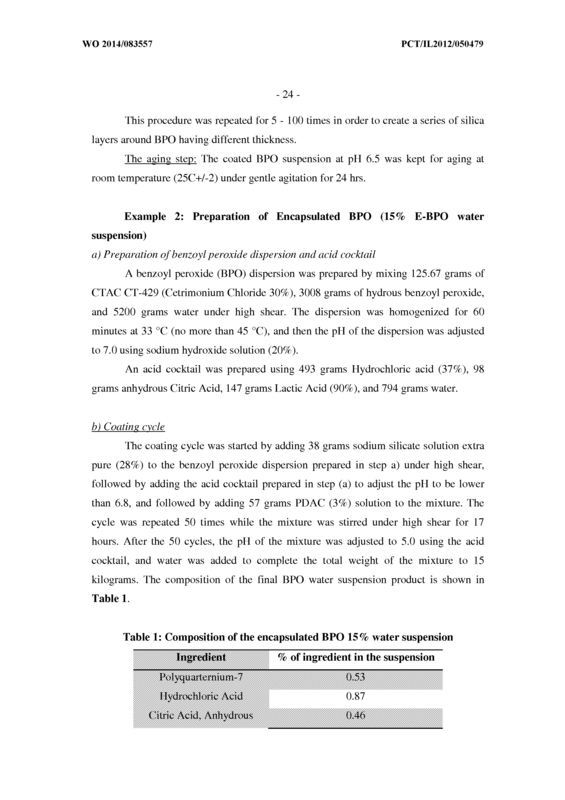 The composition of claim 20, wherein said oil in said oil in water emulsion is selected from the group consisting of paraffin oil, isopropyl myristate, caprylic/capric triglyceride, squalane, squalene, almond oil, castor oil, olive oil, jojoba oil, sunflower oil, soybean oil, grape seed oil, dimethicone, cyclomethicone and mixtures thereof. 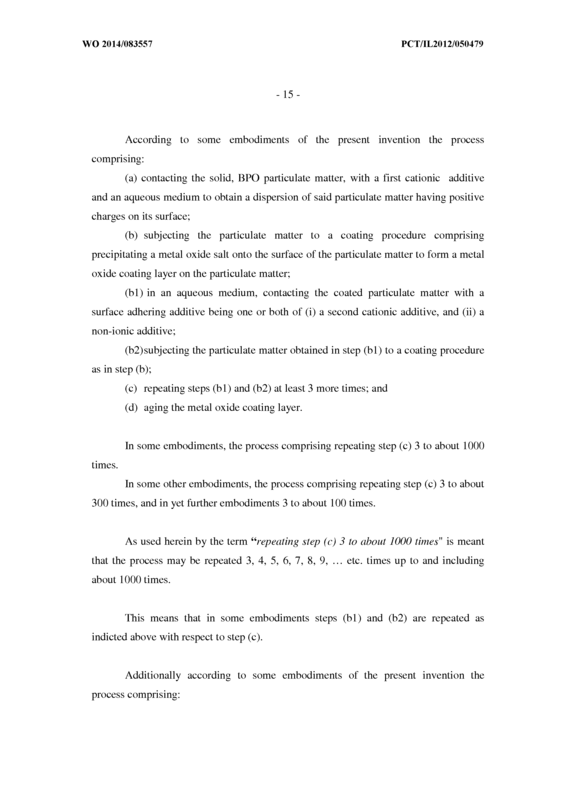 The composition of claim 26, wherein said oil in present in the composition in an amount in the range of about 0.05% w/w to about 50% w/w. 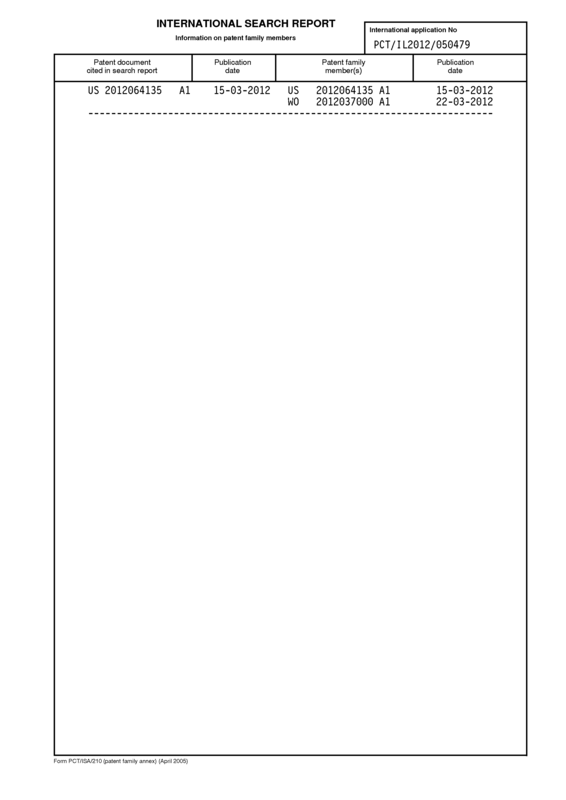 The composition of claim 30, wherein said water in said oil in water emulsion further comprises at least one water soluble humectant. 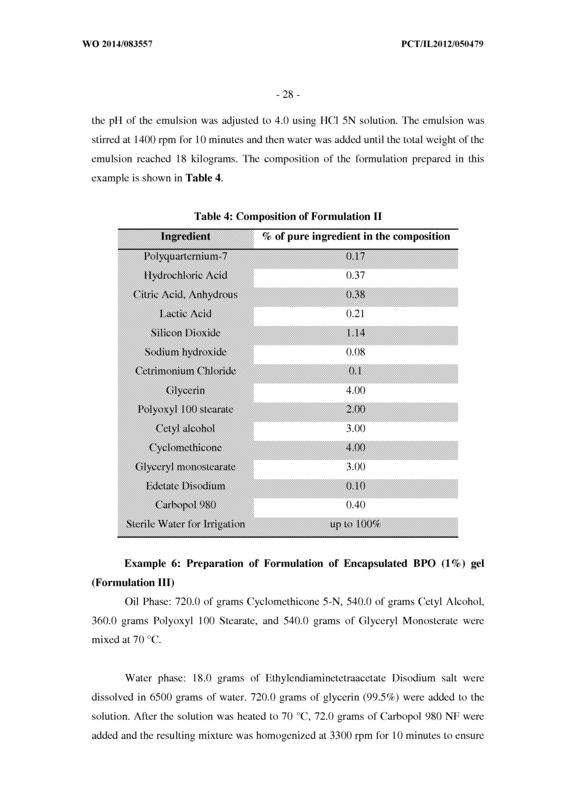 The composition of claim 31 , wherein said at least one water soluble humectant is selected from the group consisting of propylene glycol, glycerin, and polyethylene glycol -X, where X is in the range of 200 to 10,000. 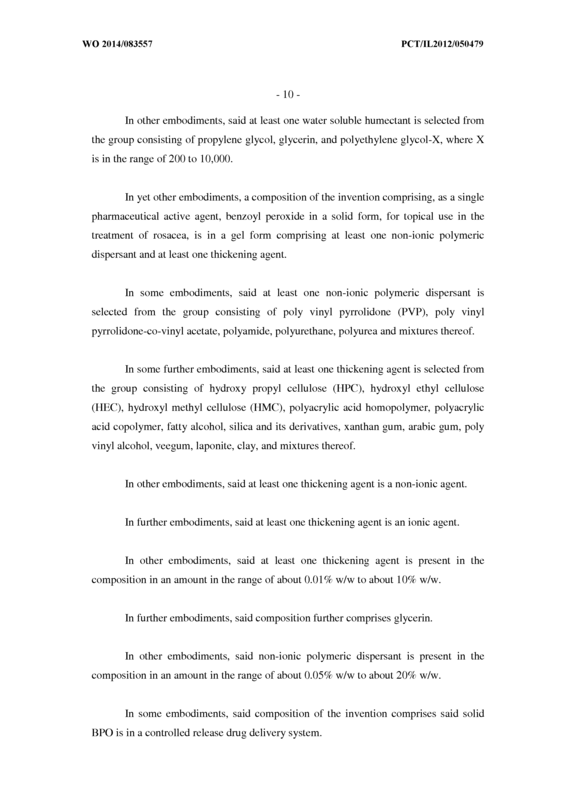 A composition according to claim 1 or 6, wherein said composition wherein said composition is in a gel form comprising at least one non-ionic polymeric dispersant and at least one thickening agent. 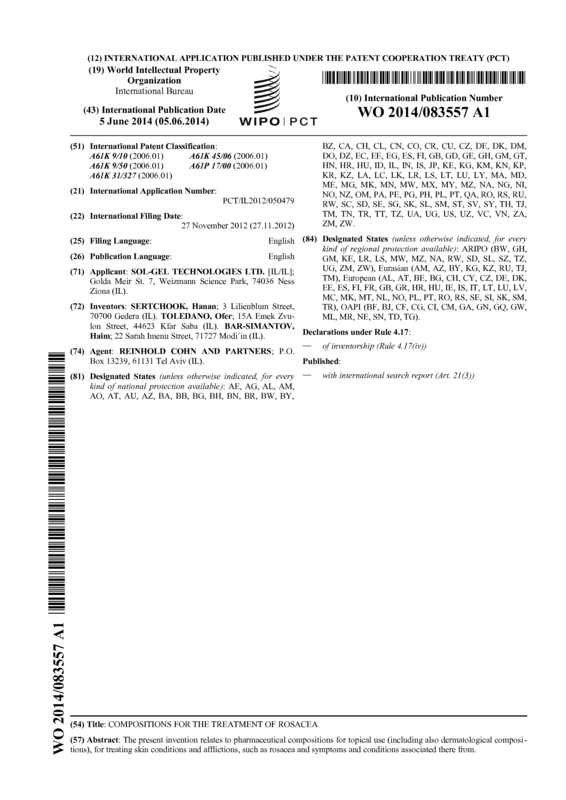 The composition of claim 33, wherein said at least one non-ionic polymeric dispersant is selected from the group consisting of poly vinyl pyrrolidone (PVP), poly vinyl pyrrolidone-co-vinyl acetate, polyamide, polyurethane, polyurea and mixtures thereof. 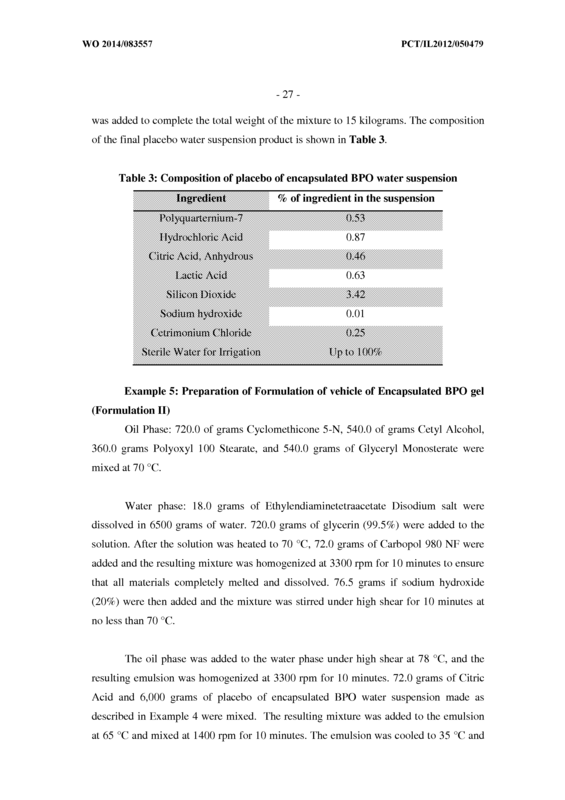 The composition of claim 33, wherein said at least one thickening agent is selected from the group consisting of hydroxy propyl cellulose (HPC), hydroxyl ethyl cellulose (HEC), hydroxyl methyl cellulose (HMC), polyacrylic acid homopolymer, polyacrylic acid copolymer, fatty alcohol, silica and its derivatives, xanthan gum, arabic gum, poly vinyl alcohol, veegum, laponite, clay, and mixtures thereof. 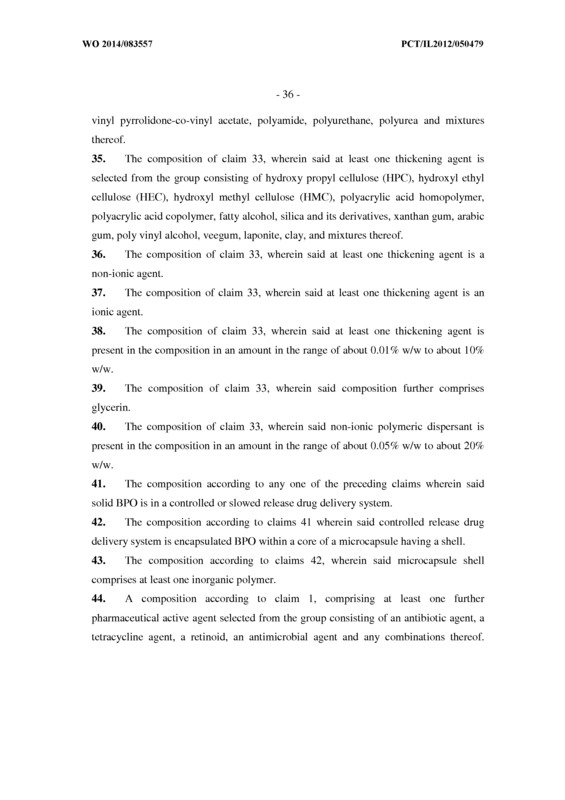 The composition of claim 33, wherein said at least one thickening agent is a non-ionic agent. 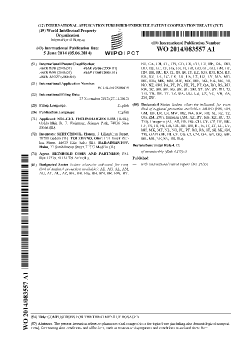 The composition of claim 33, wherein said at least one thickening agent is an ionic agent. 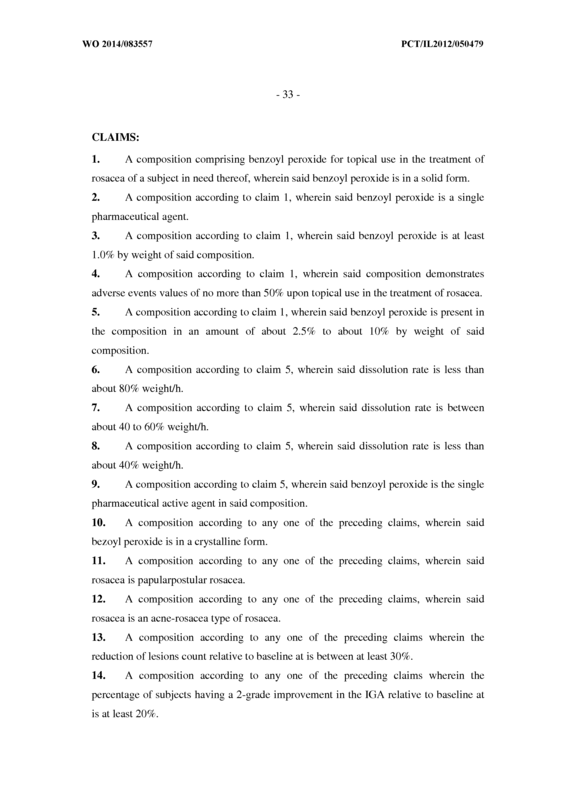 The composition of claim 33, wherein said at least one thickening agent is present in the composition in an amount in the range of about 0.01% w/w to about 10% w/w. 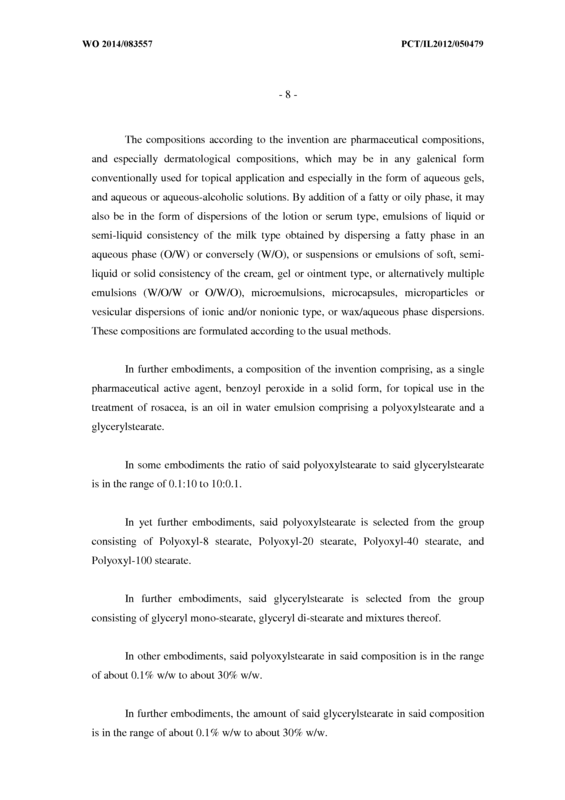 The composition of claim 33, wherein said composition further comprises glycerin. 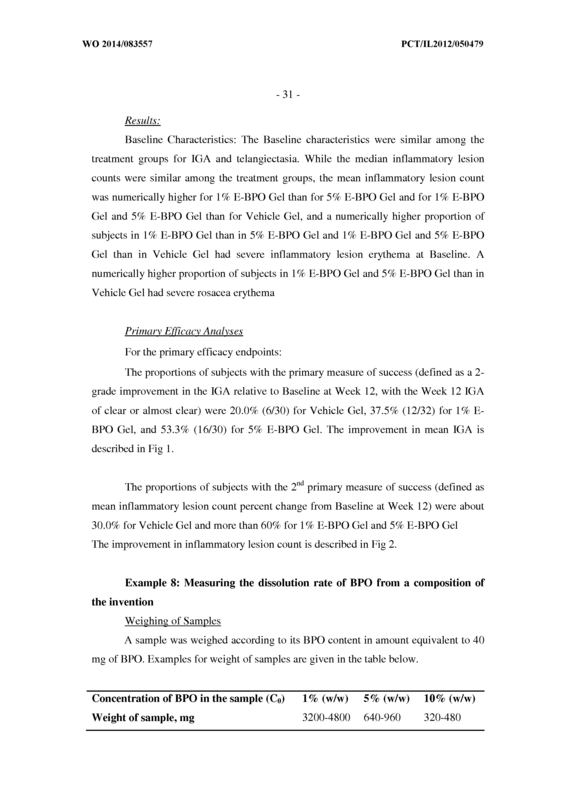 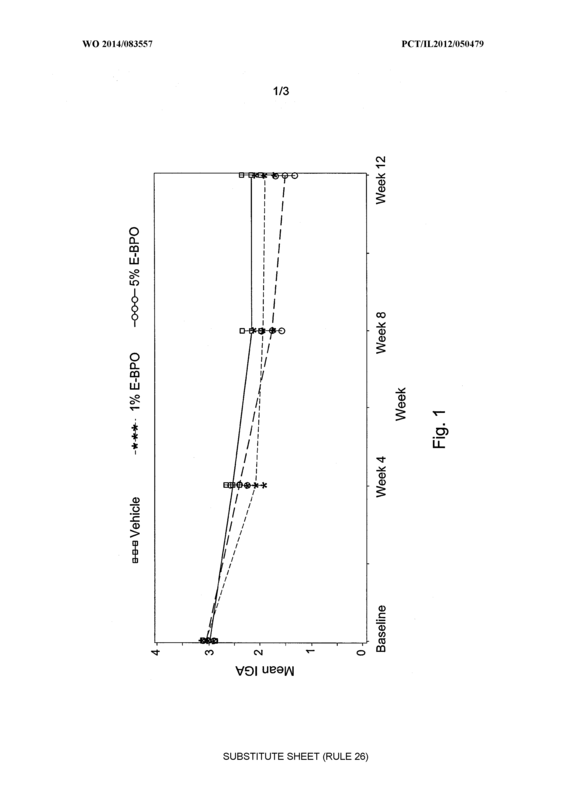 The composition of claim 33, wherein said non-ionic polymeric dispersant is present in the composition in an amount in the range of about 0.05% w/w to about 20% w/w. 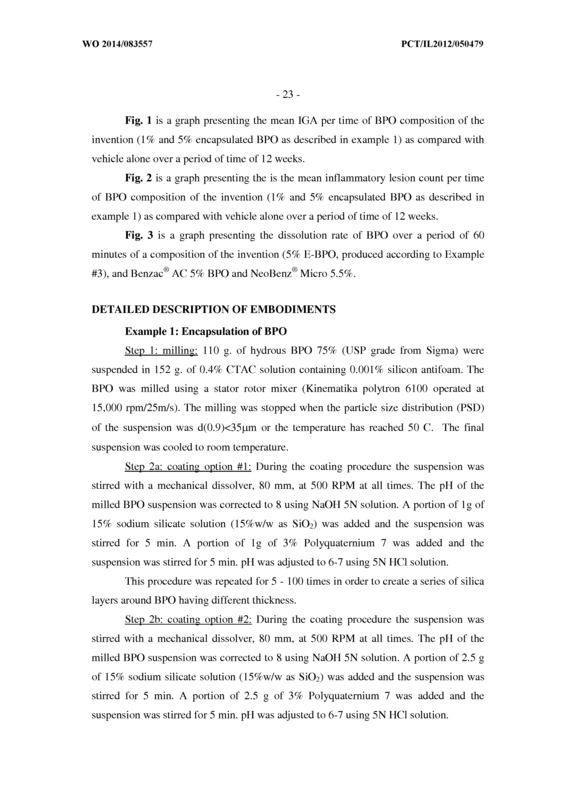 The composition according to any one of the preceding claims wherein said solid BPO is in a controlled or slowed release drug delivery system. 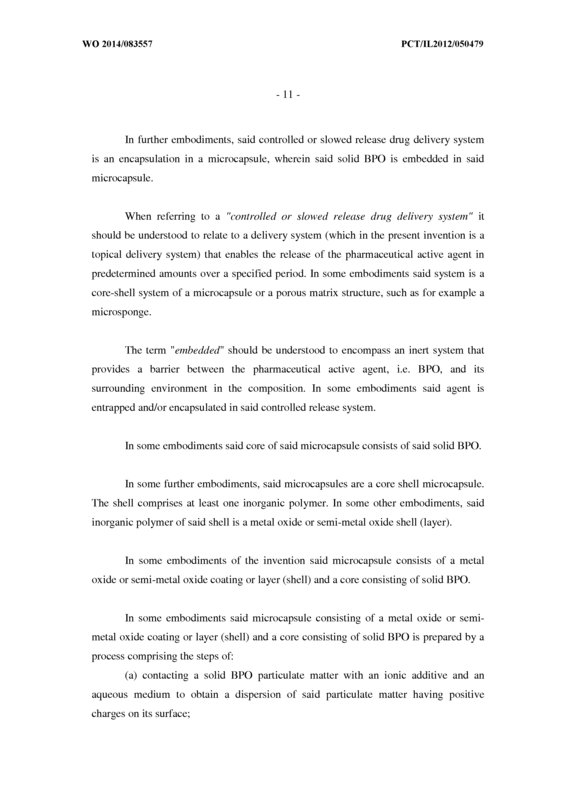 The composition according to claims 41 wherein said controlled release drug delivery system is encapsulated BPO within a core of a microcapsule having a shell. 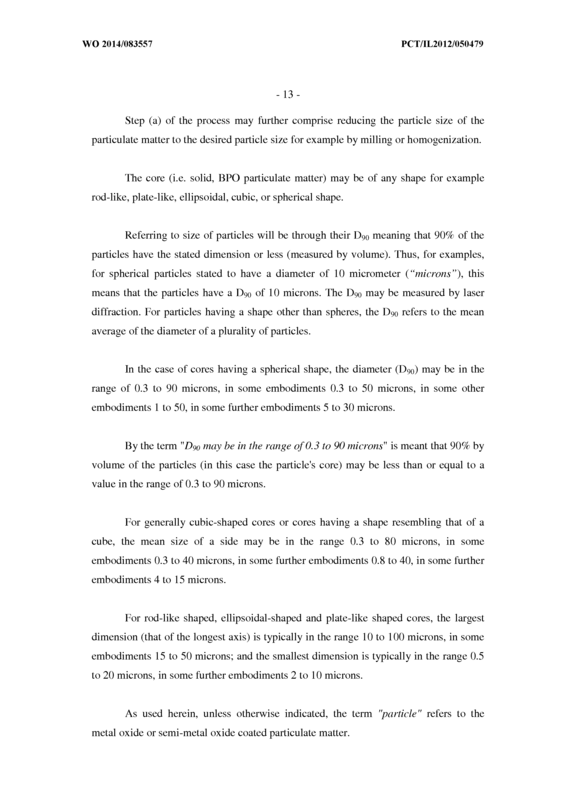 The composition according to claims 42, wherein said microcapsule shell comprises at least one inorganic polymer. 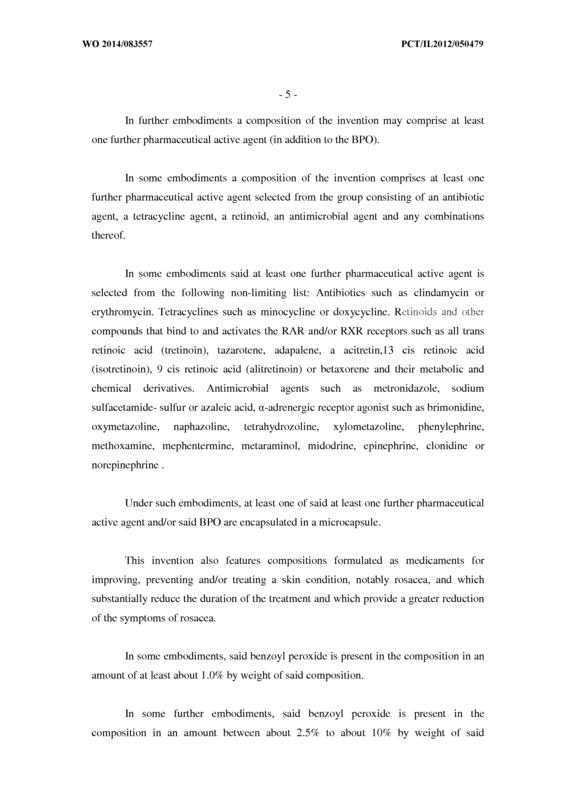 A composition according to claim 1, comprising at least one further pharmaceutical active agent selected from the group consisting of an antibiotic agent, a tetracycline agent, a retinoid, an antimicrobial agent and any combinations thereof.